REELECTIONIST Senator JV Ejercito has vowed to push for the institutionalization of compensation and benefits for Barangay Health Workers (BHWs) and Barangay Nutrition Scholars (BNS) now that the Universal Health Care (UHC) is already a law. In a speech before 8,000 or more BHWs and BNS in Batangas City, Ejercito cited them for their important roles in terms of health protection and promotion at the grassroots level. “Ang mga BHW at BNS ang nakilala kong masisipag na nagtatrabaho sa ating pamahalaan. 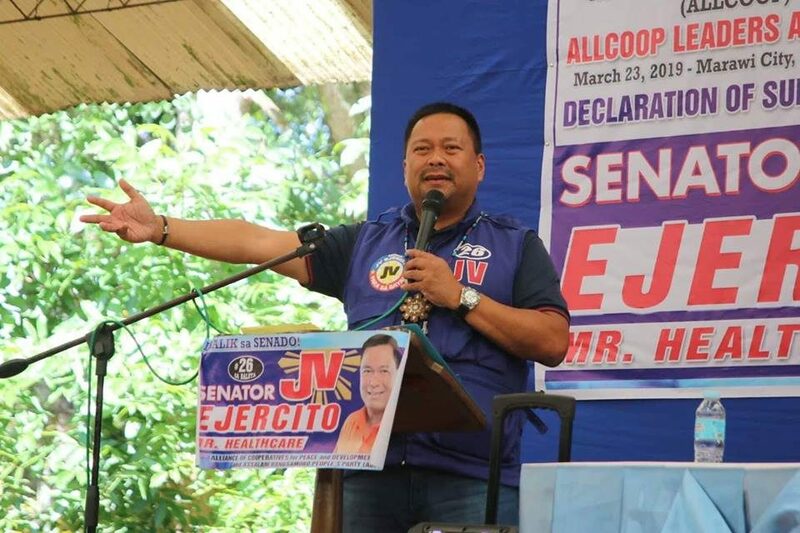 Kayo ang foot soldiers kahit umuulan, umaaraw kayo ay umiikot sa barangay,” Ejercito told them during the birthday celebration of Batangas Governor Hermilando “Dodo” Mandanas last Monday. Ejercito said BHWs and BNS are indispensable frontliners of the government’s health service as well as in the implementation of UHC. “Ang tagumpay ng UHC ay nakasalalay din sa inyong (BHWs, BNS) mga kamay. Sa inyo nakasalalay ang preventive at primary care para hindi na lumalala ang sakit ng sinumang dadalhin sa health center sa inyong komunidad,” he said. Ejercito said if reelected, he would prioritize a measure that would uplift the quality of life of BHWs and BNS, and their families, especially now that their knowledge is needed to ensure that the implementation of UHC will be successful. “Huwag kayong mag-alala mga BHW at BNS na pinaka-overworked pero pinaka-undercompensated. ‘Di ba kayo voluntary lamang, nabubuhay lamang sa allowance? Pero dahil sa inyong pagnanais na makapagsilbi sa bayan, ginagawa pa rin ang trabaho. Kayo po ay magigiting, kayo din ay modern day heroes, hindi lang ang OFWs (Oveseas Filipino Workers),” he said. NextAlay natin sa kanila ang ating isinulong na National Integrated Cancer Control Act at Universal Health Care Act.